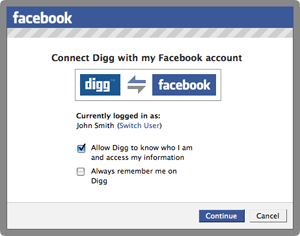 Digg has done a lot of talking about integrating Facebook Connect, but not much in the way of actual implementing. That changes today, we’ve heard from a source close to the company, and Digg will go live with the service some time today. Facebook gets another big name partner on its increasingly popular Facebook Connect platform. Digg CEO Jay Adelson has suggested that Facebook Connect is the future of Digg, and that Facebook’s massive userbase will both spur Digg usage and provide a collaborative filter on stories. With Facebook Connect users will be able to cross-post, share Digg activities on Facebook and auto-follow Facebook friends. Every time you perform an action on Digg (leave a comment, submit a story, etc.) it will ask if you’d like to share with your Facebook friends. 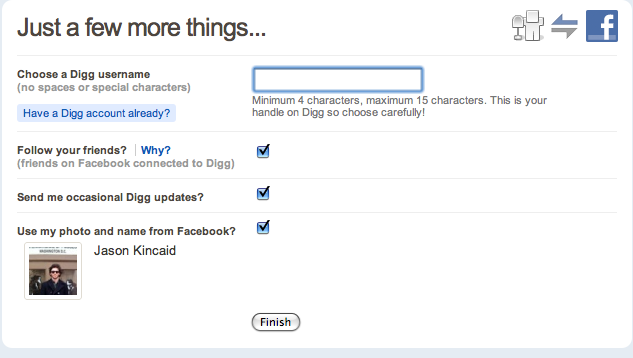 At this point you’ll have to approve sharing every time, but soon you’ll be able to set Digg to share all your activity on the site. What’s taken Digg so long? Facebook’s 200 million users go with Digg like peanut butter and chocolate. CBS had an early implementation of Facebook Connect back in September, nearly 8 months ago. See our recent video interview with Digg’s Kevin Rose.